For the past two weeks, we have had lobbyists from our local and others in Albany. Due to our work and calls, we have gotten our Call Center Bill out of the committee and are trying to get a vote in the Senate and the Assembly. Verizon has sent at least 1000 call center jobs overseas. 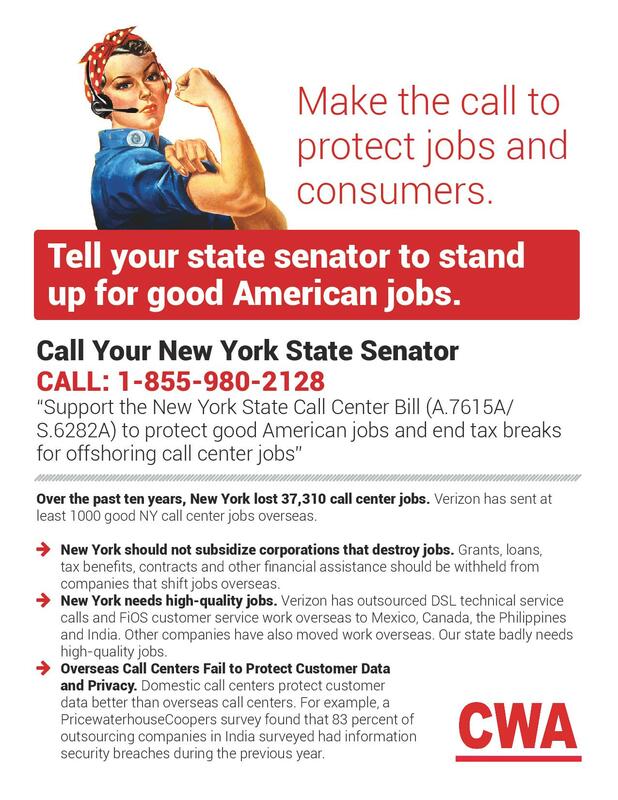 NYS Senate bill S.6282A would penalize companies by ending tax breaks for offshoring call center jobs, promote bringing good jobs back and rewarding companies that bring them back home and require a PCS hearing before a utility could move them out. Overseas call centers fail to protect customer data and privacy. We need our members to make calls to today. Today is the last day of session and if the bill does not get voted on today it dies. We need you to call both the State Senate, 1-855-980-2128 and you local Assemblymember to tell them to Vote Yes on the Call Center bill. You can find the contact information for your local Assemblymember here. When you call, 1-855-980-2128, urge them to get bill S.6282A for the Senate and A. 7615A for the Assembly to the floor for a vote and vote 'Yes'!